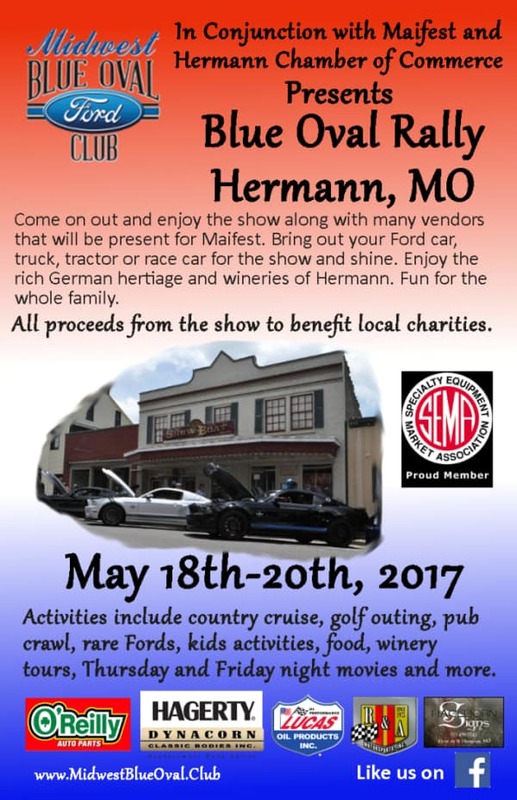 Hundreds of Fords and thousands of people will descend upon historic Hermann, Missouri for the Blue Oval Rally on Maifest weekend in 2017. Show off your Ford-powered machine on the streets of town, stay in a bed & breakfast, cruise around to the various wineries, hunt for antique treasures at the many shops – so much more to do! The Midwest Blue Oval Club is teaming up with the organizers of Maifest. Maifest begins on Friday May 19th and ends on Sunday May 21st. 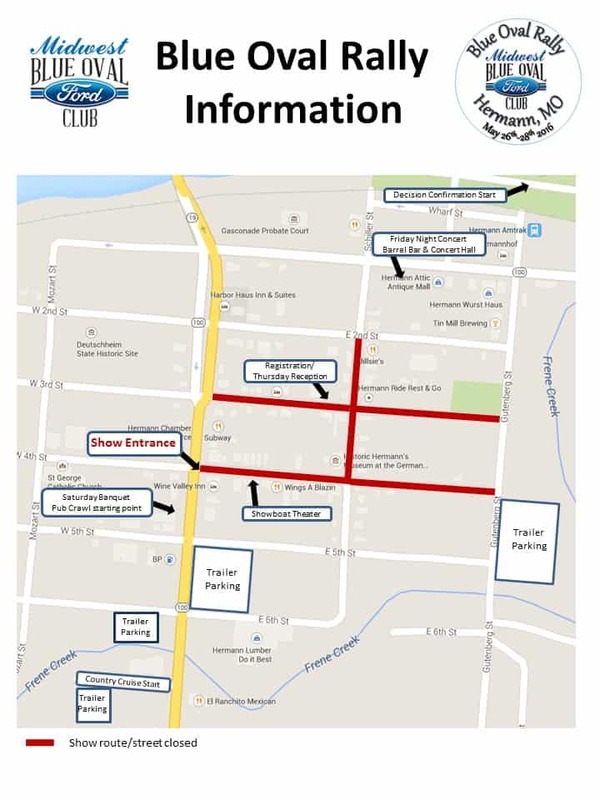 During this time, participants of the Blue Oval Rally can ejoy all the activities of Maifest to include a beer garden and concert Friday night organized by the Hermann Jaycees, vendor displays at the show and a parade on Sunday. The Wine Trolley tour is back again this year. Take the trolley and visit the wineries all around Hermann without getting a DUI. Also new this year is we are giving out free event t-shirts to the first 50 who register. There is a limit of one per registration. If you would like more than one event t-shirt, it will cost only $15.00. New this year will be a cruise to Wright City MO to tour the Mittler Brothers Machine and Tool facility. The Mittler Brothers are an inovatior of tools for NASACAR before releasing them to the public. Park Pride – This organization is raising funds to help fix up the city park. There are many items in the park that are in bad shape and need to be replaced. We hope that giving to this organization will help them in trying to achieve their goal. If you would like to know more about this organization or want to help, please visit their Facebook page by clicking here. Crusade Against Cancer – This organization help local cancer residents get to and from doctor visits. Showboat Theater Restoration – Restoring the Showboat Theater back to its glory days. They need to purchase many items to get this theater back into shape. The Vinchester Inn is our host hotel. Registration activities and reception will take place on the first floor. The address is 129 E. Third St.
Online and pre-registration ends on May 9th. 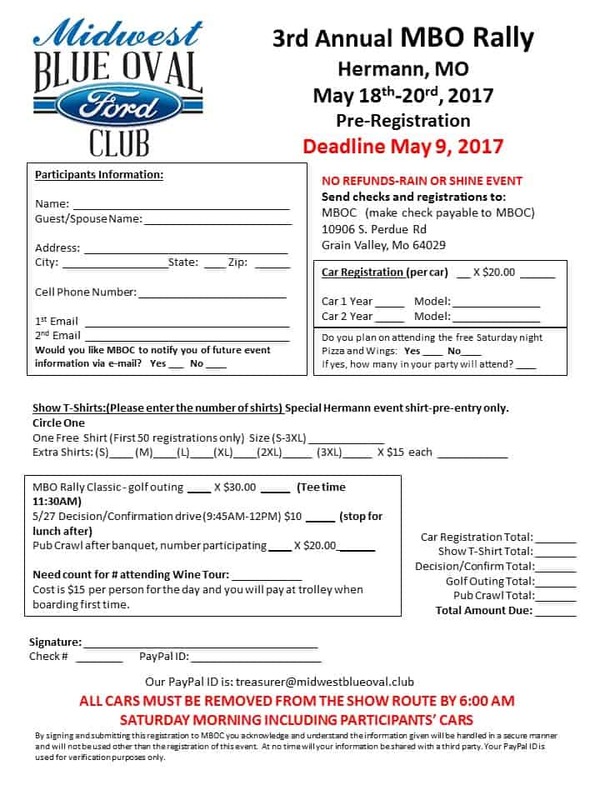 If you mail your registration, we must recieve it by the May9th deadline. If you would like to register online, click here. Click on the registration to enlarge and select print from your browser. 7:30PM Hermann Night at the Movies, Presented at the Showboat Theater on 4th St.
9:30AM Decision Confirmation car cruise – Meet at the Hermann Riverfront Park for 10:00AM departure. 1:00PM Winery Tour – Meet at the Vinchester Inn to board the trolley. 2:00PM Mittler Brothers Cruise – Meet at Hermann Ford on the side street between the dealer and the car lot. 8:00AM Gates open……registration will be open until 12:00PM. If you want to park together as a group, you must arrive as a group. 11:30AM The Maifest Maipole dancing will perform at the intersection of E. 4th St and Schiller St.
12:00PM Thunder on the River – Dedicated to all of our military, law enforcement, fire fighters and fallen Ford enthusiast. 2:30PM – Kids Korner closes and the presentation of awards at the PA booth. 3:00PM Show closes and presentation of the scavenger hunt winning basket at the Wine Valley Inn. 8:00PM Pub Crawl (Poker style) – Meet at Sharps Corner bar. Must be 21 and over to participate. Payout is 3 places and 50 percent of the money goes to our named charity. Click on the show flyer for a larger image. Click here to check lodging availability.Click here to for a list of places to stay. Click on the picture to go to the site.